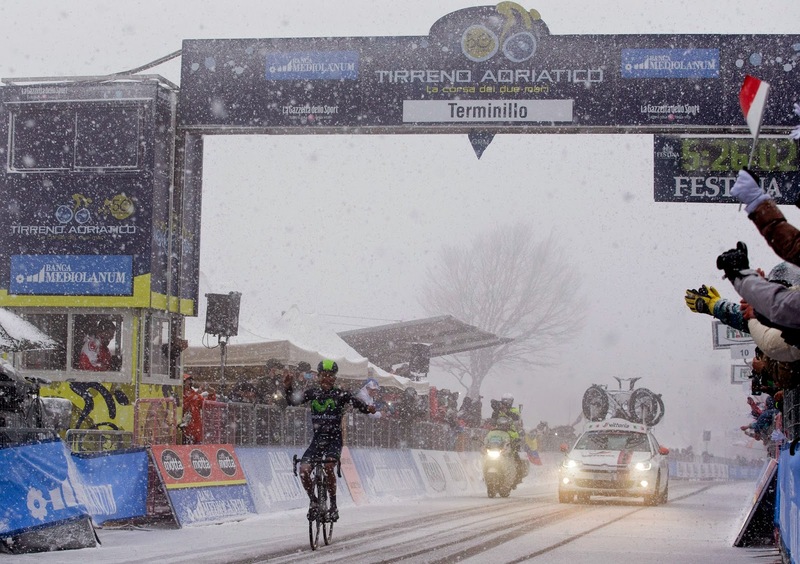 The pre-race press conference of the 50th Tirreno Adriatico 2015 took place this afternoon at race headquarters in Lido di Camaiore. The event was attended by Alberto Contador (winner, Giro d’Italia 2008, Tour de France 2009, Vuelta a Espana 2008, 2012, 2014), Vincenzo Nibali (winner, Vuelta a Espana 2010, Giro d’Italia 2013, Tour de France 2014), Nairo Quintana (winner, Giro d’Italia 2014), Rigoberto Urán, Fabian Cancellara and Peter Sagan. Chris Froome was going to participate but will not race due to a lung infection. 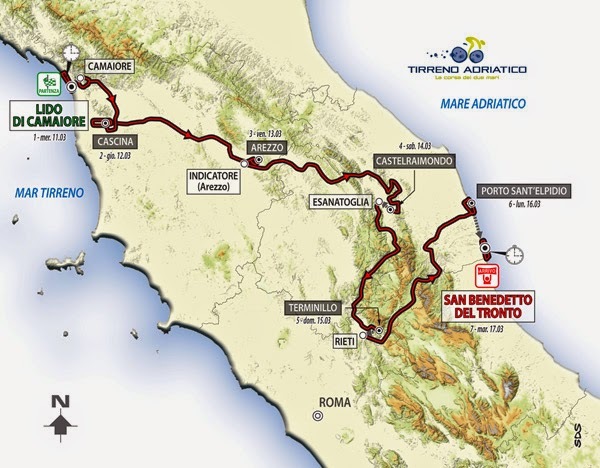 The 'Race Between Two Seas' starts tomorrow with a 5.4km individual time trial (due to the extreme weather conditions that have affected Tuscany and in particular the area around Versilia it became necessary to modify the first stage from a long team time trial to the 5.4km individual time trial). 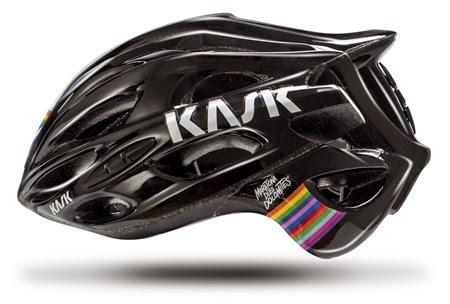 The peloton is packed with other great riders, including General Classification contenders Bauke Mollema, Joaquim Rodríguez, Daniel Martin, Thibaut Pinot and Jurgen Van Den Broeck; sprinters Mark Cavendish, Elia Viviani, Sacha Modolo and Luka Mezgec; and attackers such as Greg Van Avermaet, Filippo Pozzato and Edvald Boasson Hagen. Vincenzo Nibali: “My year has started differently from last year. 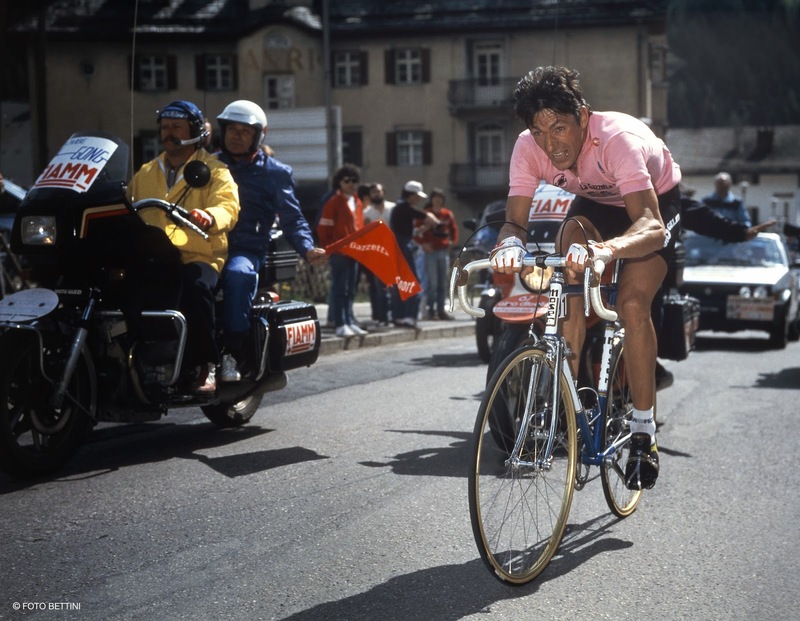 In 2014, my objective was the Tour, but after riding the Giro and the Vuelta, I struggled to find my rhythm. This year, my goals are the same, but I have tried to work harder in the winter. 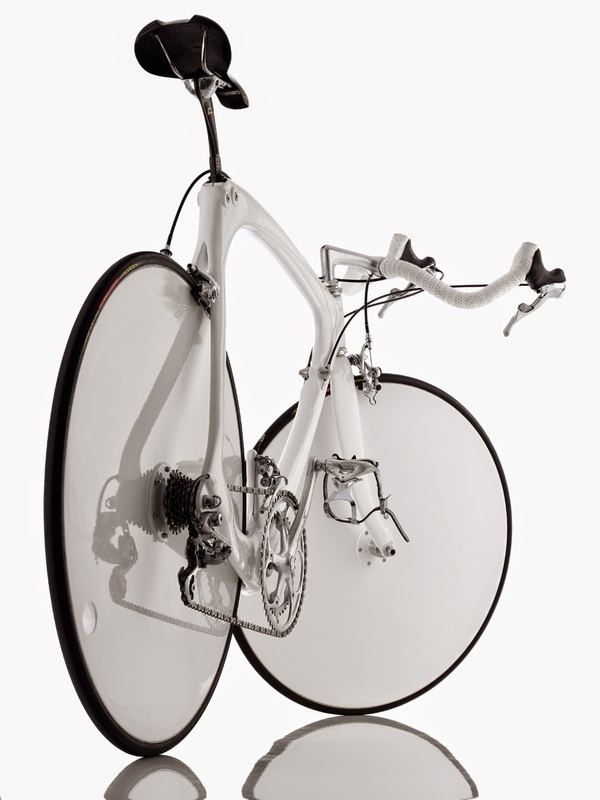 I’m not in my Tour de France condition, and I haven’t ridden against Alberto [Contador], Rigoberto [Urán] or Nairo [Quintana]. 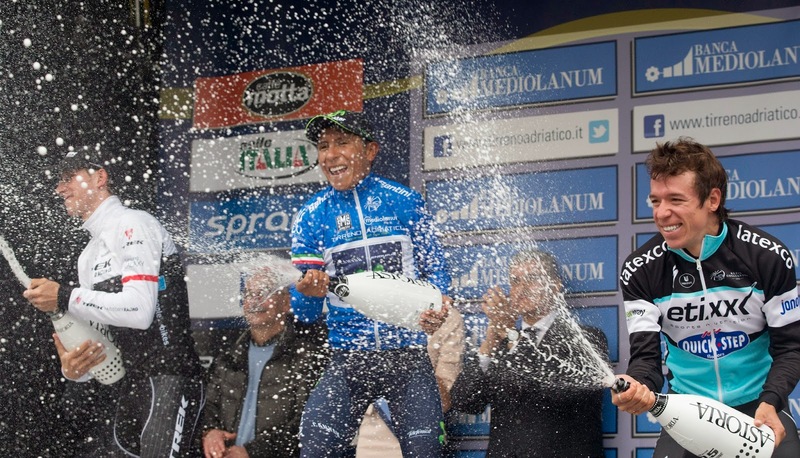 They are all great riders, and Alberto has had great results already this season. So we’ll see day by day and, if I feel good one day, I’ll see what I can do, and then we’ll see how the GC goes. 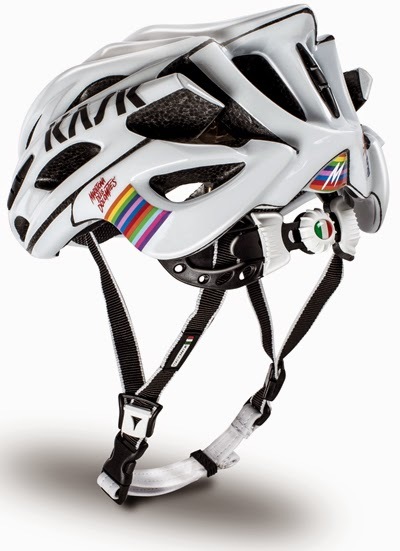 The race will start from Camaiore’s renowned Lido, in the Italian Versilia region, with a 5.4km individual time trial.. The first rider, Davide Villella, will leave the start ramp at 1.10pm CET tomorrow afternoon; the last rider, Alberto Contador, will start at 4.04pm. 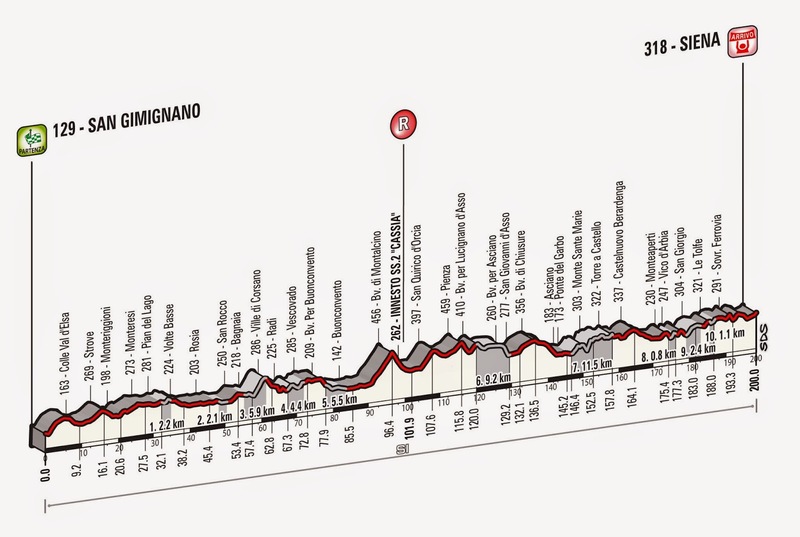 The second stage, starting from Camaiore and finishing in Cascina (153km), is mostly flat and is likely to see the fastest wheels in the peloton sprint for the finish. Cascina will be the starting location of the 203km third stage and, as per last year, will end up in Arezzo on the same climb that saw Peter Sagan win. 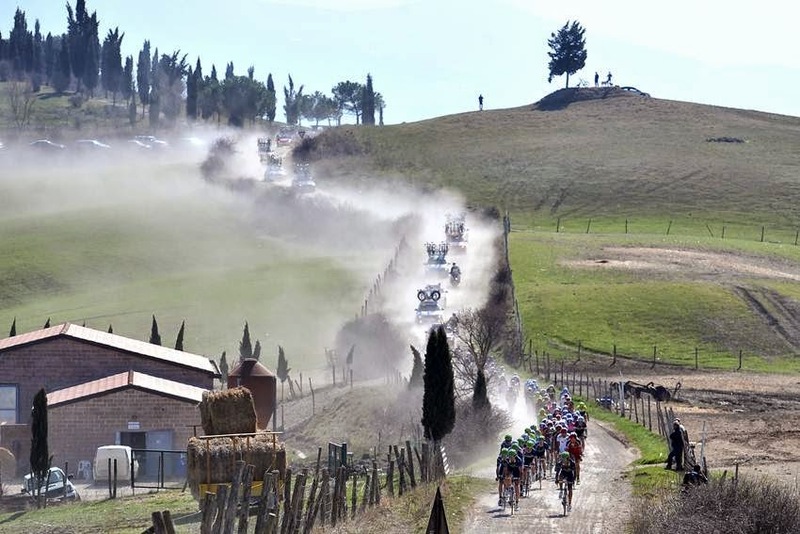 Saturday the 14th will see a deceptively challenging 226km fourth stage, held predominantly between the Umbrian and Le Marche regions. The stage will start from Indicatore (Arezzo) with four King of the Mountain climbs: Foce dello Scopetone, Poggio San Romualdo and the final Crispiero climb twice just before the short descent towards Castelraimondo. 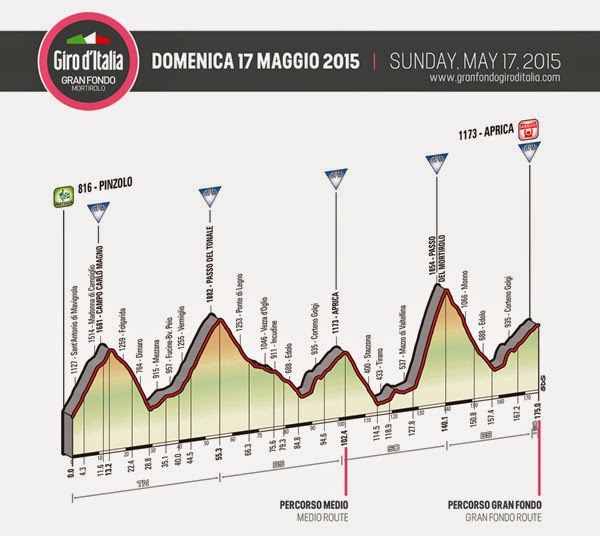 The 197km Queen stage will be held on Sunday 15th, starting from Esanatoglia and finishing at the summit of Monte Terminillo (1,675m), with two KOM climbs in the initial and central phases of the day (Passo Sallegri and Le Arette climbs). The 210km penultimate stage, which is ideal for sprinters, will bring the peloton from Rieti to Porto Sant’Elpidio. 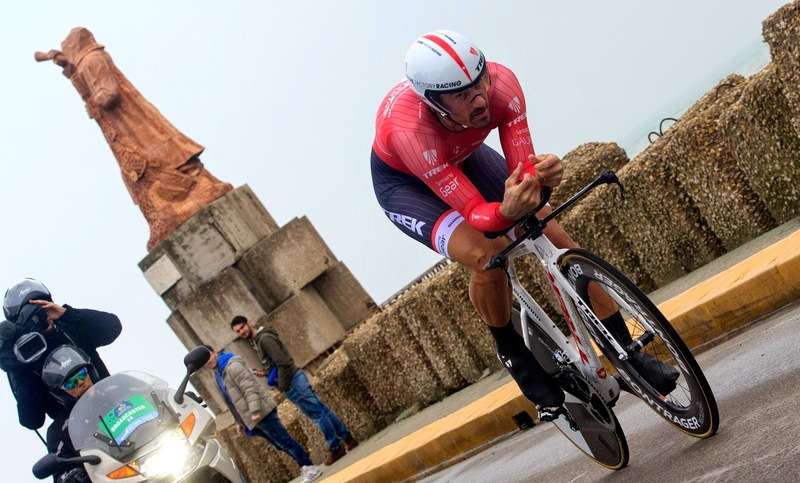 The 50th edition of the “Race of the Two Seas” will again come to a close in San Benedetto del Tronto, with a final-day 10km Individual Time Trial crowning the winner of the Tirreno Adriatico. Haute Route Dolomites Swiss Alps 2015, Geneva, Switzerland to Venice, Italy. 31st August to 6th September (seven con secutive stages), 893 Km, 23,500 meters of elevation gain. A largely changed route, with more than 50% of the course new compared to last year, featuring 12 breathtaking new ascents and a record amount of climbing in the second edition of the Haute Route Dolomites Swiss Alps in 2015 (August 31st to September 6th). 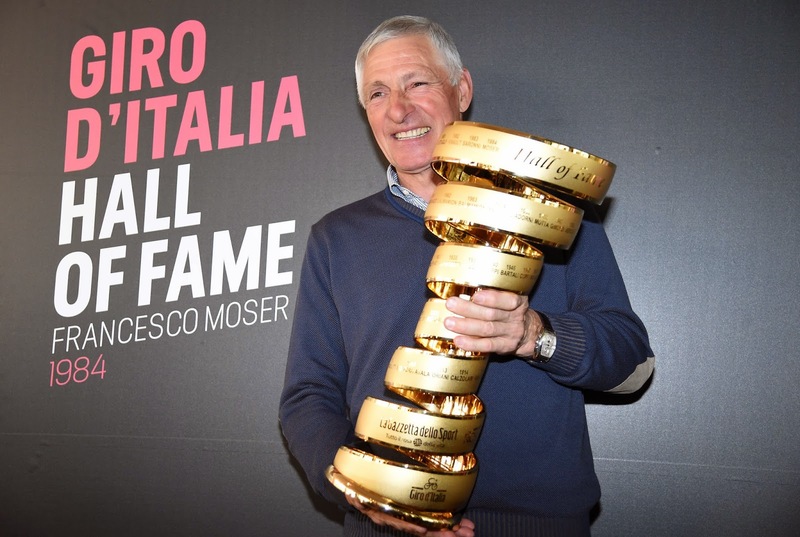 This new course will offer the toughest ever Haute Route course and includes the giants of the region new to the event, such as, the Passo del Bernina, Passo Sella and Forcola di Livigno on the west-to-east course — a first for the event. The 893km course covers a staggering 23,500 vertical meters of climbing between Geneva, Switzerland and the finish in Venice, Italy. While the event is set to live up to its billing as the world’s highest and toughest cyclosportive, riders can still rely on the trademark combination of professional-level rider support and unrivaled post-ride facilities after the organizers have announced the inclusion of tried and tested host venues from last year’s inaugural event. 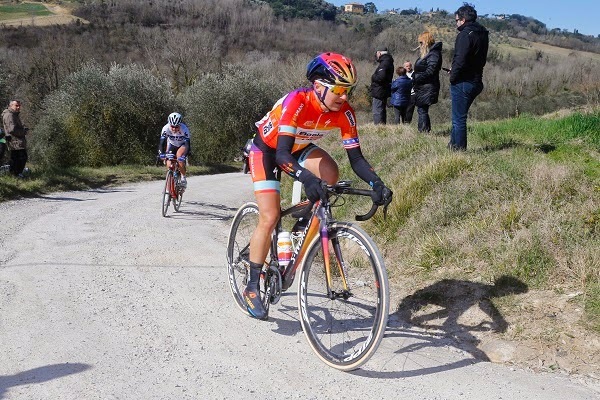 America's Megan Guarnier (Boels Dolmans Cycling Team) has been crowned the inaugural Strade Bianche Women Elite champion, after a solo break 20 km from the finish line. The Boels Dolmans Cycling Team completed a remarkable day, placing Elizabeth Armitstead in second 37" behind her teammate. Elisa Longo Borghini (Wiggle Honda) finished 3rd in same time. 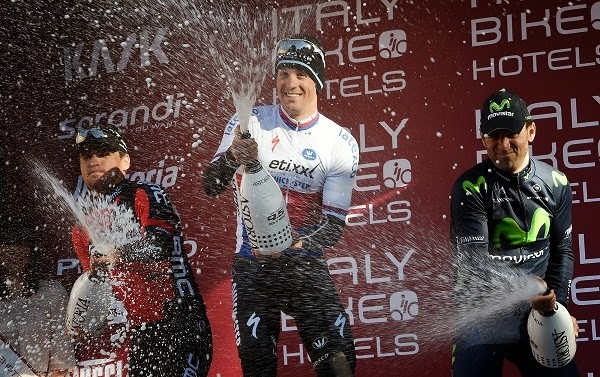 Zdenek Stybar of the Czech Republic won the 2015 Strade Bianche Eroica Pro, finishing ahead of Belgium's Greg Van Avermaet and Spain's Alejandro Valverde. With 10 km to go these three riders led the race, with a 15" lead over the chasing group. In the final moments of the race Van Avermaet attacked on the final climb, dropping Valverde, Stybar countered and won by 2". 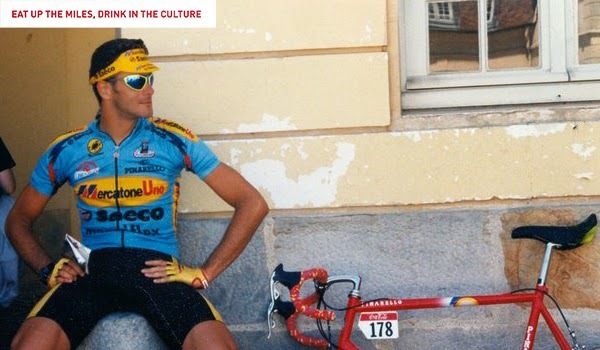 2 - Greg Van Avermaet (BMC RACING TEAM) at 2"
3 - Alejandro Valverde (MOVISTAR TEAM) at 18"
The where and history of this "road" here. Thanks to Buzz for the info.